A maxi dress is more versatile than you might think and can easily be transformed from casual to elegant to workplace-ready depending on how you accessorize. 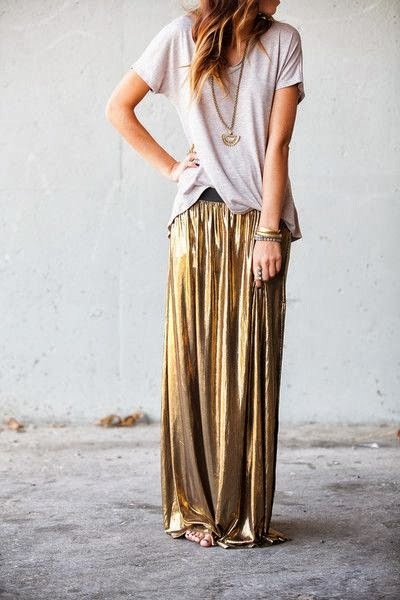 Striking a balance between casual and glamorous, it's no wonder the maxi skirt continues to be a major trend. This closet staple works year-round, but feels most at home in our summer wardrobes—lightweight fabrics and pretty prints go hand-in-hand with the super-feminine style. Length is Key: Just like with the maxi dress, the maxi skirt should be ankle/heel-skimming. If you need to tailor your skirt or get it hemmed so that it’s just right, it’s worth it! Waist Height (Rise): Some maxi skirts are low-rise and others are high-rise. A mid-rise skirt is, obviously, the most versatile — if you’re looking for an investment piece that can cover a number of different occasions, mid-rise is for you. Mid-rise generally sits at the top of the hips, or just above. A high-waisted skirt should sit comfortably at your natural waist (near the navel), and a low-rise one should sit easily (and securely!) around your hips. Volume: Maxi skirts are great for balancing your frame. A slim skirt will emphasize narrow hips, or balance a bigger booty if you’re smaller on top. A voluminous skirt will visually balance a larger bustline, or create a little more oomph in the back. Work your awesome body however you want to! Try the skirt on under good lighting before buying. Walk in it, swish around in it and see if it feels comfortable first. If you're tripping up, it's too long. Then check how it looks in the mirror––the more streamlined styles will be the most flattering, while the flouncy Bohemian styles can add weight and don't flatter all figures. While maxi skirts have proved themselves to be a classic item, many of this season’s hottest options incorporate trends like tie-dye or high-low hems. To achieve a fully on-trend look without looking too overdone, try keeping your outfit monochromatic. Wear the right shoes. If you're petite, wear heels to give you the added height to cope with the skirt length and to elongate your silhouette. If you're taller, flats or heels will work with a maxi skirt, although heels are usually preferred for evening wear. Most heels will work well with maxi skirts but always check in the mirror before deciding. Beaded sandals are appropriate for a flowing, Bohemian maxi skirt look. Espadrilles also look very casual and beach-like. Wedge shoes look great with maxi skirts and give you added height to carry off the longer skirt. Avoid flats that are completely closed in, or loafers. These look frumpy with long skirts. Pointy toes and knee-high boots don't work either. And clogs and sneakers tend to look too chunky. And always remember to accessorize. Accessories are your friends. Wear a necklace, a watch, a bracelet. Add a belt, thick or thin, over the maxi skirt or over your shirt. Add a cute hat or a fun pop of lip color. And try different shoes. I love wearing flats or sandals with my maxis, but heels work too. Just have fun with it!